Unbelievable! Tomorrow is the 1 year anniversary of Blue Velvet Chair (read the blog post where it all began). 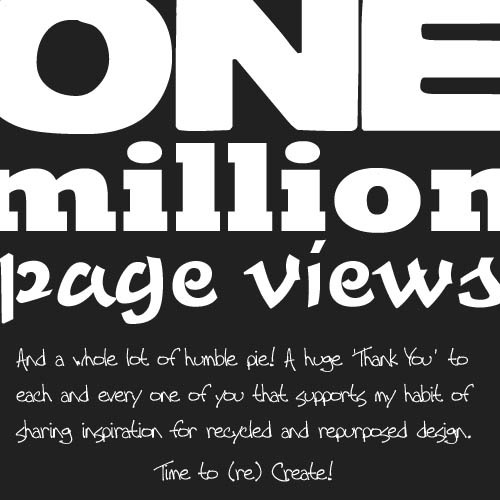 And yesterday the blog hit the milestone of 1,000,000 page views. It took me a couple of months to really find ‘my blog voice’ for recycled and repurposed creations – and there’s been no looking back since! I’ve enjoyed every moment – and every comment – and every question – and every challenge – and every new connection. I’m humbled, and so very thankful that you appreciate and enjoy all the possibility of recycled and repurposed design, arts and crafts as much as I do. To each and every one of you I say THANK YOU, and I send the appreciation right back to you! And I always find inspiration on yours! A big thank you, Joyris! Congrats Mike! So happy for your success – well-deserved because this is a really stinkin' cool blog! Love it – love you! That's awesome! You deserve it. I can always find inspiration here on your great blog. Huge Congrats! That's totally awesome. Congratulations on your very special milestone. Thanks, Martha. Given what you've already posted, I'm really excited to seeing more inspiration from your pages. Love that red & white chair. Amy – Seriously…that means a lot seeing as I'm a fan of you! Thanks! wow!! a million is a heck of a lot of page views in a year! somehow i'm not surprised since your site is my consistent "go to" for unique ideas, fabulous photos and creative collections. Hi Mike: I found you when you posted my blog to your facebook page. Thanks so much. This means a lot to a new blogger and I love your site. After the kids get to school, I'll spend some time here… getting filled up w/ inspiration. Congratulations on your one year anniversary!!! What’s That ?! – Recycled What Can You Do With… Recycled Sinks?